I have been needing a better way to secure my bike/bikes in the bed of my truck for quite some time. As you can see from these pictures there are a few problems. 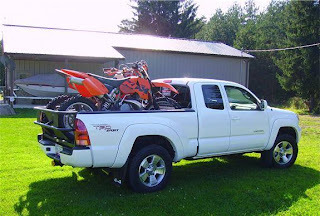 First, the front lip of the bed is not strong enough so whenever a bike or anything else with any weight is strapped down into it, it bows and bends toward the cab. The second problem is the lack of any real support for the front tire, so it slips around and the bike falls over. The third problem is the length of the bed. It's just a few inches too short for the tailgate to close with a full size dirt bike. This can be solved by the putting the bike in crooked or removing the tailgate etc., but if you want to put more than one bike in it becomes more difficult, and impossible to put 3 full size bikes in. The rear tire also tends to wander back and forth. Here is my solution to the first 2 problems. You can buy these for $100 to $200, but I had some scrap metal lying around that was just the right size so I decided to save the money and build one custom to my needs. There are a few extra holes in this piece from a previous project that I used the piece in, but they won't affect the performance and they are not too noticeable. The pieces I have seen for sale are 60" wide for a full size bed, which is exactly what this piece was when I started. It's a bit short of the full width of the bed which allows the holes on the end to double as tie downs. I thought of making it the full width, but it would have added work and decreased is usefulness. This piece will bolt to the front lip of the bed and secure two front tires. 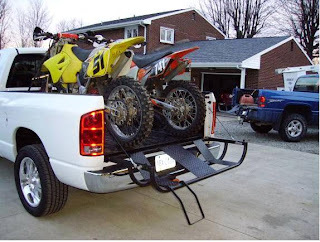 A third bike can be put in the middle facing towards the rear, so the support for the third bike would be on the tailgate. Here is the solution that I am going to try to use for the bed length problem. This tailgate is called the "trailgate", and adds much more length to these trucks than what I will need. These sell for $500 to $600, and I will use this idea to build my own with some metal I have in my garage. They lock shut similar to the stock tailgate to secure the bikes, and have the added benefit of a lower tailgate height when lowered for easier loading. This one is showed with the optional folding step.